Nardo is waiting to meet aspiring writers ages 8-88. A compilation of original writing exercises designed to develop creative thinking, offbeat insights into the writing process, and a story about a very negative character. Nardo, the «snake within», is out to undermine the author’s creativity. ﻿Everyone harbors﻿ a creature like this, and WOTL will help you get to know yours. It provides a hands on, holistic, creative experience that will take your writing to new h﻿eight﻿s! Buy Nardo T-shirts and bags: Europe and the US. 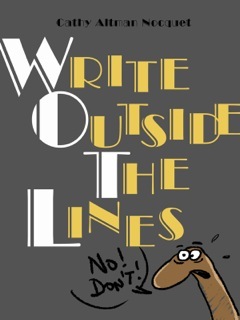 Writers and Educators Recommend "Write Outside the Lines"
«What happens when you put Robin Hood in the sewer with a band of merry microbes? Or start a story on the inside of an eyeball? You discover the wonderful, outlaw joy of writing a story that no one else has dared try before. In "Writing Outside the Lines," Cathy Altman Nocquet shows aspiring writers of any age how to have more fun -- and be more productive -- than they ever thought possible. - George Anders, New York Times best-selling author and co-recipient of the Pulitzer Prize for national reporting, 1997.